This is another in a series of reflections on the Aṣṭasāhasrikā-prajñāpāramitā-sūtra as I read through it in Sanskrit with a friend. Despite the central importance of this text in Mahāyana, it is curiously neglected. Only one complete English has been published, though several partial translations exist. No modern commentary has been produced, though there are a handful of book chapters and articles (and one book which is a collection of such). The Chinese translations seem to have had more attention. It would be a great shame to lose sight of this most important Mahāyāna text. I noted in an earlier post that the nidāna of Aṣṭa tells us that there are ((13 - 1/2) * 100) or 1250 arhats present for the action. Although Lokakṣema's translation (ca. 179 CE) includes some bodhisatvas, none of the other versions of the text mention bodhisatvas being present. And yet, most translators seem to think that the Buddha asks Subhuti to "explain to the bodhisatvas". Then the Bhagavan addressed Senior Elder Subhūti: "Subhūti, from perfect understanding of practitioner-aspirants, explain the way that practitioner-aspirants have gone forth to perfect understanding"
The Lord said to the Venerable Subhuti, the Elder: Make it clear now, Subhuti, to the Bodhisattvas, the great beings, starting from perfect wisdom, how the Bodhisattvas, the great beings go forth into perfect wisdom! What he has done, and my friend concurs with this, is that he has read the genitive plurals (bodhisatvānāṃ mahāsatvānāṃ) as dative plurals: i.e., as "to" or "for" instead of "of". There was a tendency for the dative plural and genitive plural to merge in Pāḷi - the genitive form being used with a dative meaning. But this is not true in Classical Sanskrit. In fact, in Sanskrit, for nouns in -a, it is the dative and the ablative that begin to merge. 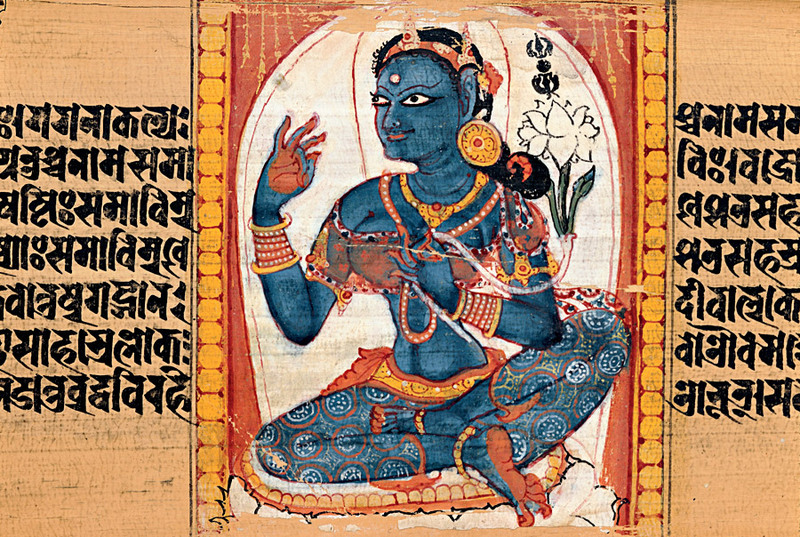 The language of Aṣṭa is more or less Classical Sanskrit. Just to complicate matters, the Gāndhārī appears to have a genitive singular (mahasetvasa). For the sake of argument, let us accept the dative reading for the moment. The Buddha asks Subhūti to explain to the bodhisatvas how the bodhisatvas have gone forth. Apart from the fact that no bodhisatvas are present, why would the bodhisatvas need to have being a bodhisatva explained to them? One implication might be that our definition of bodhisatva is in error. In this view, the arhats present are the bodhisatvas. So perhaps we need to be wary of the later definitions of bodhisatva. The Pāḷi word bodhisatta was already in use for an aspiring Buddha. Indeed, in Pāḷi, there is only one bodhisatta who is the Buddha before his bodhi. I'm unsure who first proposed this, but there is a theory that satta was wrongly Sanskritised as satva (and later by English editors as sattva). In other words, there is an argument that the Pāḷi was not satta, "being", but satta, "committed, intent on", and ought to have been Sanskritised as sakta. Caveats aside, the idea is that bodhisatva ought to be bodhisakta "committed to awakening", and it's possible that mahāsakta might have signified "one whose commitment is great". The linguistic argument on its own is not very persuasive, but consider also that Jan Nattier, in her book A Few Good Men (1993), argued that 'bodhisatva' referred not to mythical/magical beings, but to people who had committed themselves to attaining liberation. In other words, people who sought to emulate the original bodhisatta. They were what we might call full-time practitioners, in contrast to monks who were concerned with more mundane matters like running monasteries and doing magic for lay-people. "The main problem with the forest hypothesis is that Mahāyāna sūtras, the final court for any theory of early Mahāyāna, provide little support for it." (2010: 61). We could, therefore, translate bodhisatva mahāsatva as "practitioner aspirant". However, we must stress that the wrong Sanskritisation can only have reflected the understanding of the day; i.e., those who began to use Sanskrit understood satta to mean "being". So the confusion is not simply a mistaken word choice, but evidence that the word had changed its meaning. And note that the Gāndhārī text, by far the oldest Prajñāpāramitā document, unambiguously has satva. In this sense, an arhat who had been a aspirant to liberation might just qualify as being a bodhisatva. Or perhaps it trades on the distinction which occurred quite early on between an arhat and a buddha. However, working out the metaphysics of all this is tricky. An arhat has escaped rebirth so cannot be reborn, but a bodhisatva must be reborn in order to fulfil his role. Early Buddhists accepted that winning the goal meant leaving the game, while Mahāyānists could not bear the thought of continuing without their key players, so forced them to rejoin saṃsāra as iterative messiahs. As I say, there seems no obvious reason to read these words as being in the dative case. Nor does it make sense to explain things to people who are not present. So the argument for reading this as genitive, "the perfect understanding of the bodhisatvas" makes more sense (to me anyway). Additionally, there is no problem posting that bodhisatvas have Prajñāpāramitā which might be explained by Subhūti (to the arhats), whereas explaining it to them sounds wrong. For a start the connecting adverbial pronoun is yathā, which usually means something like "in that /which way", "just as", or "according to". It is a adverb of mode, i.e., describing how or the way something is done. Compare other modal adverbial pronouns: tathā, "in that way"; sarvathā, "in every way"; aññathā, "in another or different way". And so on. * There are three kinds of past tense in Sanskrit: aorist past, "I departed"; past imperfect, "I was departing"; and past perfect, "I had departed". Plus the passive past participle, "departing was done by me". Then the Bhagavan addressed Senior Elder Subhūti: "Explain, Subhūti, from the perfect understanding of the practitioner aspirants, the way that practitioner aspirants have gone forth to perfect understanding"
So, that's what it says, but what does this mean? The Bhagavan is asking Subhūti, the chief representative of the Prajñāpāramitā practice community, to explain to the arhats, the fact that bodhisatvas have perfect understanding and that they have gone forth to that perfect understanding. In Buddhism we are quite familiar with the language of going forth. Typically, Buddhist monks go forth from home (āgarika) into homelessness (anāgarika). Or we might say that we go forth from false refuges so that we can go for refuge to the triratnāḥ or three precious gifts (Buddha, Dharma, and Saṅgha). The text is hinting, I suppose, that perfect understanding is a standalone refuge. That if one has perfect understanding, then one doesn't really need the other refuges. If this is what the text is saying, then it may have been be controversial. It still is. Why the arhats need this instruction is far from clear. Aṣṭa does not have the disdain for arhats that developed later in some quarters of the Mahāyāna literature. Apart from having had a guide, there is nothing to distinguish an arhat from a buddha. Before we can even take this in, we find that the first thing Subhūti does is to deny the very terms on which the Buddha has asked him to speak (i.e., he is correcting the Buddha). We're more or less used to seeing Śāriputra as a Mahāyāna patsy, but less used to thinking of the Buddha in this role. Subhūti denies that he can see, apprehend, or perceive any such phenomena as a bodhisatva or prajñāpāramitā. In which case, he asks, "what perfect understanding would I teach to which bodhisatvas?" (katamaṃ bodhisatvaṃ katamasyāṃ prajñāpāramitāyām avavadiṣyāmi anuśāsiṣyāmi?). It turns out that precisely this is the teaching of perfect understanding; i.e., this denial that names apply to experience; or, conversely, the idea that just because you have a name for a phenomena does not make it real. This takes some reflection. But it helps to get a little of the context provided in the subsequent paragraphs. Subhūti then proceeds to outline an idea that has been central to my own understanding of the Dharma for ten years: that existence (astitā) and non-existence (nāstitā) do not apply to experience. The language mirrors the Sanskrit version of the Pāḷi Kaccāgotta Sutta (SN 12:15) - see my translation of the Kātyāyana Sūtra. And, as it happens, I have already had a preliminary go at writing about this aspect of the sūtra: Kātyāyana in the Aṣṭasāhasrikā Prajñāpāramitā Sūtra. (26 June 2015). But we can briefly say that the teaching given to Kātyānayana (or Kaccāna) is the teaching of perfect understanding. I believe I am the first person to make the connection quite so plainly. Though many people, not least David Kalupahana, have noticed that Nāgārjuna makes passing reference to the Kātyāyana Sūtra, I have not yet seen any reference to this much earlier (and defining) reuse of Kātyāyana. It's common to think of Mahāyāna as a radical departure from mainstream Buddhism. But this seems to be inaccurate. Instead, we can think of the Prajñāpāramitā working out the implications of a much older way of thinking about Buddhism as evidenced by the Kātyāyana Sūtra. In other words, they were a conservative group of meditators, focussed on experience, doing practices associated with states of emptiness (cf MN 121) or cessation (cf DN 9). They were also resisting the metaphysical speculations emerging into mainstream Buddhist discourse by this time. It is sometimes said that Prajñāpāramitā is a rejection of Abhidharma, but Lewis Lancaster's PhD dissertation from 1968 shows that Aṣṭa contains some Abhidharma elements and gradually assimilates more as time goes on. The importance of rejecting astitā and nāstitā is that it ought to prevent us from reading the text as metaphysics. I say "ought", because, clearly, it never stopped some people, notably Edward Conze. If we cannot speak of existence or non-existence, then we are not talking about reality, or truth either (the words are, if anything, more synonymous in Sanskrit). Instead, we are talking about phenomenology and epistemology. And, by calling into question the applicability of names for phenomena, Aṣṭa is inviting us to question the very basis of our knowledge about the world. The way I understand this is that, if you attain cessation, it is experience that ceases, and while it is ceased, one dwells in emptiness. And when one allows experience to start up again, it's like watching a boring film and not being caught up in it, but noticing how bad the acting, dialogue, and plot are. A lot of fluff has built up around this basic idea, but this is the essence of Buddhist liberation. From the point of view of emptiness, there is nothing to hang a name on. Imagine that we have two states: one in which there is no arising and ceasing, and one in which there is. If we treat it as "reality" (which it is not) then the fact that is it unchanging from an experiential point of view is very misleading. It points in the direction of absolute being or absolute reality. But this would be a mistaken interpretation. Emptiness is not absolute. Nothing that we can experience is, or can be, absolute. If this experience were common to meditators, and the techniques for attaining such states seem to have been quite widespread, then the contrast may well account for the dualism of Sāṃkhya-darśana and also the absolute being of the Upaniṣads. Indeed, mystical speculations about this experience may well explain a good deal about India religion more generally. Nattier, Jan. (1993).A few good men : The Bodhisattva path according to the Inquiry of Ugra (Ugraparipṛcchā). University of Hawai'i Press. Ray, R. A. (1994). Buddhist Saints in India : A Study in Buddhist Values and Orientations. New York: Oxford University Press. Aṣṭasāhasrikā: Insight and Ongoing Transformation. We're making slow progress on the Aṣṭa, but both enjoying the process and nutting out some tricky passages. I want to highlight another passage from early on in chapter one. This part of the introduction seems to serve several functions. One of the main functions is that it addresses the perennial Buddhist anxieties over legitimacy and authenticity. The aim of the text here is to establish the principle that what the disciples of the tathāgata say is authentic because it ultimately derives from him. But it also does something more interesting. Then Elder Subhūti, with the authority of the Buddha, having known the form of the thoughts of Śāriputra with his own mind, said this to Śāriputra: “Elder Śāriputra, whatever the disciples of the Bhagavan say, instruct, teach, draw out, reveal, and illuminate, it is all to be understood as the work of the Tathāgata. Because of that Dharma taught by the Tathāgata. Training in that instruction of Dharma, they realise the nature of experience and carry [the realisation] along. Having realised that nature, whatever they speak, whatever they instruct, whatever they teach, whatever they draw out, whatever  they reveal, and whatever they illuminate, is all consistent with the nature of experience. What I want to focus on here is the sentence 1.4.3 (Chapter 1, Para 4, sentence 3). In this passage there is a series or succession of related phrases using different grammatical forms. "Because of that Dharma taught by the Tathāgata." The tense is past, and the mode is passive as so often occurs with Sanskrit (deśita is a passive past participle). In the traditional guru/chela relationship it is the teacher who is active at this point, and the student is a passive recipient of the teaching. Or more literally the "pointing out", since √diś means "point". Not like modern ideas of education. Guru, as we know, means "heavy", while cela means "cloth or clothes" (though it can also mean the "mere outward appearance", or "slave"). It's not clear how this word came to be used in the sense of "disciple". Here dharmaḥ appears to mean the teaching of the Buddha. In other words, they adopt a lifestyle and are taught to interact with other people; they are taught meditation techniques, and how to interpret their experiences of meditation in a particular theoretical framework, according to the ancient doctrines of Buddhism. Note that the Dharma was taught by the tathāgata, the "one in-that-state". This is the basis of the claim to legitimacy of these ideas. Everything that enlightened Buddhists say or do is ultimately traced back to the the ultimate authority in Buddhism, the original tathāgata (though note that what Buddhists mean by this shifts over time). "Training in that teaching of the Dharma." Here the tense has become present and the mode active (via the present active participle). Both the pronoun and the noun are in the locative case. The cognitive metaphor that comes to mind for an English speaker is that the teaching is a container; one trains in it. Almost as though one enters a special room which is set up for the purpose of practice. A virtual environment. Or even an abstract "sacred space". Śikṣā can mean learning, study, or training (i.e., both the more cognitive and the more practical elements of learning). The verb √śikṣ is from the desiderative mood of the verb √śāk, "to be able, capable" (whence śākya). 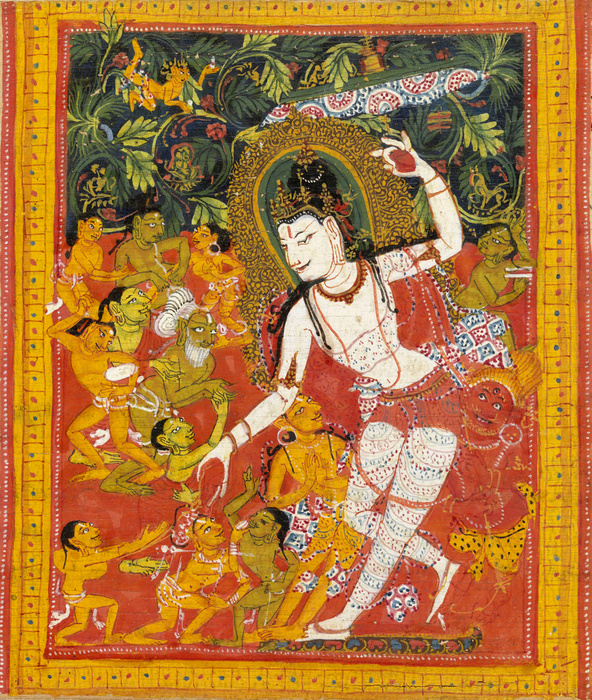 So śikṣā reflects a "desire to be capable". So we begin with learning as a passive activity and then proceed with the student or pupil as an active participant, trying to fulfil their desire for competence or capacity. Incidentally, in early Buddhist texts these two phases have two different outcomes with respect to confidence. The outcome of the passive phase of learning is faith (saddhā), usually faith in the tathāgata; while the outcome of active training is perfect clarity (aveccapasāda). So, despite what mainstream Buddhists say, saddhā or śraddhā is precisely the passive faith of the newly converted. It carries us through into training, but is eventually replaced by one's own understanding. Faith is very much the right word for this initial phase of confidence in the teacher. It is blind in the sense that it has not been tested, but not blind in the sense that it cannot be tested. And as a result of having been taught and putting it into practice two things happen. One gains personal insight (sākṣātkurvanti) into (the) nature (dharmatā) and one carries it one (dhārayanti). It is not explained here what is meant by dharmatā. But we get this dichotomy that one is taught the Dharma and one realises dharmatā. The -tā suffix makes an abstract noun. These refer to ideas, qualities, and states that cannot be experienced with the five sense. So in a sense this is saying that by practising the Dharma one has a personal insight into the idea of the Dharma. The word I'm translating as "personal insight" is sākṣātkurvanti, a verbal compound sa-ākṣāt + √kṛ. The first part sa-ākṣa means "having eyes"; and is only used in the ablative of cause "from having eyes"; which is taken figuratively to mean "before one's eyes, evidently, in person, etc". And it is combined with a form of the verb √kṛ "do, make". A single word translation might be "realise", but it maintains the connotation of a personal insight. Something that has been seen with one's own eyes, as it were. As we know, seeing is a metaphor for knowing in both English and Sanskrit. "I see" means "I understand" in both languages. Of course, with an abstract noun the word must be metaphorical, since abstractions cannot literally be seen. So the student "sees" the nature (dharmatā). A lot of my recent published scholarship has involved infiltrating Sue Hamilton's hermeneutic of experience into interpreting the Prajñāpāramitā literature as also being concerned with experience rather than metaphysics. Hence, I prefer to think of dharmatā referring to the nature of experience. This is exegesis rather than translation, but without the proper interpretative framework (or hermeneutic) a text like the Aṣṭa rapidly becomes incomprehensible. However, realisation itself is an experience and thus only fleeting. A true insight will change the "seer", or at least change their perceptions of experience. They may no longer feel any sense of experience being owned, for example - there is a flow of experience for them, but they do not feel it is "my experience" (though it continues to be their experience and no one else's). The verb √dhṛ means "carry, maintain, preserve, practice, undergo." With respect to the mind it can mean "remember". Here we are using the causative form, so the sense is "causing to remember (i.e., memorising)" or "maintenance". My reading is that the ongoing effects of the realisation are what is meant here, rather than any reference to remembering. One has an experience of (what we Buddhists call) "insight" and is left with an ongoing change in one's perceptions. What Jeffery Martin calls "on-going non-symbolic experience". One of the things that interests me here is that a century or two later, the Pañcaviṃśatisāhasrikā-prajñāpāramitā-sūtra introduces the idea of the dhāraṇī as something to be attained, alongside samādhi. In other words, the bodhisatva, by practising, accumulates a range of samādhi and dhāraṇī. And this use of dhāraṇī has puzzled scholars, because it does not clearly relate to the other uses. I think that this early (and somewhat confusing) use of dhāraṇī might relate to the ongoing nature of the changes wrought by meditation on one's perceptions of experience. Other uses of the word dhāraṇī were tacked onto this basic idea; first as the mnemonic practice in the Pañcaviṃśatisāhasrikā—which uses the Gāndhārī alphabet as a reminder of a sequence of words, which in turn form the basis for a series of reflections on śūnyatā); and subsequently as the magic spells chanted for protection. I've already noted how the opening sentence of Aṣṭa has some dhāraṇī-like qualities. We see this again here in the sequence: bhāṣante deśayanti upadiśanti udīrayanti prakāśayanti saṃprakāśayanti. Again if we made these nouns, with the -e ending, and added svāhā at the end, it would be indistinguishable from the type of dhāraṇī than began to appear in Mahāyāna texts a few centuries later. And there is evidence from the Chinese texts that the original phrase had just one verb, bhāṣante, and that the synonyms were added later. Another way of looking at these lists over synonyms is that they are a form of auto-commentary. The earliest version simply had bhāṣante "they speak" and then someone elaborated, by adding five synonyms, just in case we didn't get it. On the other hand √bhāṣ "to speak" is one of the most common verbs in Sanskrit, so it hardly needs explanation. Finally, the text concludes that whatever is said—by someone who has been instructed in Dharma, practised it, and realised the idea behind the Dharma (dharmatā) and experienced ongoing shifts in their interpretation of their experience—is consistent with the nature of experience. The text goes on to say a little more about this and justify it, but we have the gist. Here then is the justification for going beyond the ancient stories and legends of the Buddha. It is because the experience of a personal insight into the nature of experience is common between the Buddha (presuming he existed) and the contemporary teachers who bring new perspectives on the experience and new ways of explaining it. Having had a realisation, it is carried on and informs the teaching of the next generation. Of course, not everyone accepted such arguments, but over about five centuries Mahāyāna gradually became the mainstream in Buddhist India and it was Mahāyāna that spread to most of Asia. Even the Theravādins in Sri Lanka flirted with Mahāyāna briefly before purging it and taking a conservative stand on their own stories and commentaries. This is a text that requires and benefits from a considerable amount of unpacking. And this requires an interpretive framework. It is better to consciously choose a framework, rather than relying on intuition, and it is better to choose one that is fruitful in terms of practical and actionable insights. I think the hermeneutic of experience is the best interpretative framework available to us. I didn't invent it by any means, but as I have applied it over some years now, I find it resolves paradoxes, creates sense from nonsense, and recasts the mystic in pragmatic terms. One of the main things we look for in our literature is suggestions for practice. Metaphysical or mystic interpretations don't give us that. Even if this is not what the authors intended (though I believe it is), it is still the best way to approach any Buddhist text, because it informs approaches to practice that have long been confirmed by experience. My final comment is that Conze seems to get almost every sentence wrong in his translation. He obscures more than he reveals. The need for a new, accurate, and reframed translation is urgent. I cannot understand why this text has not been retranslated in the way that, for example, the Pāḷi texts have been retranslated. Of course, nowadays we have a partial Gāndhārī text (dated to ca. 70 CE) and we give a lot more weight to the seven Chinese translations (though not all equally). So, any study of the Pala Dynasty Sanskrit manuscripts would need to be accompanied by parallels from the Gāndhārī and Chinese versions where they shed light. It would be a major undertaking (and is beyond the scope of what I could achieve).